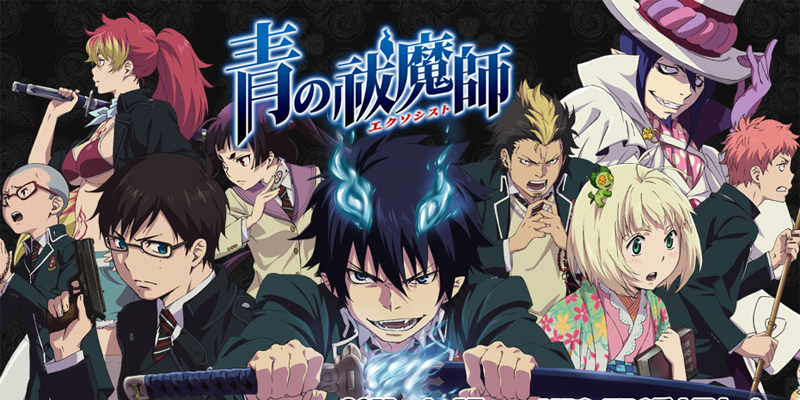 The last episode of the first ever season of Ao no Exorcist the anime TV series was broadcasted October 2, 2011. With it, the pain of the manga fans was over; the pleasure of the anime fans was halted. Fortunately for everyone, though, another project has been named, a movie based on the same story, about which we are expecting more news before the end of the year (hopefully). Will it be capturing all the facts of the manga that was missing from the original anime series or not, there is no such information. Shinigami-sama hopes that they will not attempt it and considers that it is highly doubtful having in mind that there s probably no movie, with anime series available, that is canon. Anyways, since the official end of the animated TV series of Ao no Exorcist (The Blue Exorcist) I have decided to add my two cents to the money bank of opinions on the show. Here is the story in short: there are two mirror-dimensions of the world. One of them is bright and resembles more the world we know – it is the human world of Assiah, the other is Gehenna – the demons’ lair. Although by rule travelling between the two should be impossible, demons have found a way to penetrate the limits of the human world – by possession of an item that usually belongs there. Satan is the king of demons, yet, he cannot find a container strong enough for him to reside for as long as he needs to overtake Assiah. For this reason, one night he decides to create a child – part human, part his – to use him for his plans. A long time had passed since this happened, and his son is already a young man. Rin Okumura, the son of a priest and twin brother of a shy and clumsy boy, needs to decide – will he fight demons and become an exorcist or will he take over the world together with his father – Satan. First, let me start with my favourite part: Anime vs Manga Comparison. There are a lot of differences between the two, although usually the anime adaptation is like an exact copy of the manga but animated, occasionally there are such instances where the anime, for one reason or another, takes on a different route. Now, considering the multiple anime and manga communities, this tactic is never good enough to make the anime as good as the manga in the eyes of the fans. It is, though, good enough to create legends such as Hellsing and Fullmetal Alchemist, whose original series had barely a slight connection with the original story. Naturally, a lot more are the anime that couldn’t continue because of the strange plot that they have ended with. This list includes Pandora Hearts, Soul Eater, D. Gray Man (though not as much). And these are only the ones I have personally watched. Let’s not even mention Rurouni Kenshin and the ‘filler arc’ that sprung within the last 30 or so episodes. So, in other words, taking the original story and infiltrating a filler within something that is actually being developed in it is a big no-no for the industry. And yet, Ao no Exorcist did just this. Don’t ask me the reason, I have no idea. I can only guess, though, that the producers have anticipated this to be a great hit and that is why they have started broadcasting an animated adaptation of the story as early as they did. If they have just waited half a year or so, they wouldn’t have ruined it for the manga fans. Yet, here we don’t have the appreciation non-manga fans have. Even the ones who have seen only the anime can say that there was something very big that lacked. It was sense. Without spoiling too much about the plots of both manga and anime of Ao no Exorcist, I have to say that to me, the show made Satan into a wuss, a dependable creature weaker than even common human beings, the mother of the Okumura twins an evil witch who is plotting world dominance and the entire story that is still being developed in the manga useless and irrelevant due to the fact that the anime actually showed us some kind of a weak and senseless alternative development and ending of the arc. The characters, when the anime quit following the manga, became weaker and the story lacked a lot. All in all, the comparison is in full favour of the manga series and the anime gets my minus a million score. To be honest, it was a disappointment bigger than Baka Ouji from Level E being trolled himself. Second, I will speak about the anime itself. As a whole, I have to say I am feeling so-so about the anime. The graphics are definitely good when it comes to character design and fire-effects, but the Gehenna gate… every single time it made me think I was back in 1970 (although I haven’t been in this dimension at that year) watching some beginner-level animations. The story was okay, but it looked too vague, hell even Bleach filler arcs are better thought-of. I have no idea how the original creator even let them make a plot-summary even less – the series’ continuation as a whole. The good thing is that it is possible for me to ignore what has happened since the fillers began and the anime TV series deviated from the ongoing manga. It won’t be easy, but if the two stories don’t clash too much with each other, I can be fine. It is a definite bonus since the director and the screenwriter have obviously planned at least one more season. Considering how great the manga is, I would give them another chance. Just stop with ruining good bad characters and making them lovey-dovey softhearted sulkers (both Satan and Igor Neuhaus intended). I will not spoil it too much, but there were so many inconsistencies. First, they tell us the mother of Satan’s children was too weak to bare them and so on, then we see she couldn’t live on for she was banished from society and a Satan lover. What about Satan taking Shiro’s body in order to make the kids? Not necessary? Okay… What about the fact that there could be just one and only Paladin? What happened with Arthur Augusto Angel? Did he become a lower-grade exorcist after becoming the Paladin? Why would he just stand this? If he wasn’t demoted then what happened with the century-old hierarchy of the organization? It ended up being melted and reformed by someone who was not even supposed to be a part of it? Some fat geezer with a thing for stupid twins? No way. In the end, I shall give you my suggestion: Do not expect something too big out of this anime. It is filled with inconsistencies and the story passes from one to another without a reason or adequate link between the two phases. Characters change, but they do not develop. What happened to Ao no Exorcist is almost exactly what happened to Code Breaker. Being a loyal fan of the manga I was excited when I heard it was being made into an anime. The first couple of episodes were like the manga so I was hopeful, but then they ruined everything. They started to get away from the manga and wonderfully ruined a potentially top twenty anime. I hate it when this happens to perfectly good mangas. Unfortunately, I believe you are very right on this. However, considering the amount of chapters published when the show was announced, it was to be expected. The other unfortunate thing is that it seems that many new anime (shounen anime to be precise) suffer from this. If they keep on doing it, there will be nothing left for the shounen fans once One Piece and Naruto end. With Katekyo Hitman Reborn!, Bleach and Beelzebub already gone it is getting harder and harder for them. I haven’t read the manga yet, but read a lot of good things about it, will do read it when I got some time to spare. There are less inconsistencies and it has a better flow. I definitely prefer it. This cannot be a direct manga vs anime since the two depict different events, but (at least to me) the anime lacked a lot, especially in the last few episodes. Yeah, they’ve pretty much lost it… Hope they sell the merchandise fast enough, so we don’t have to watch more of this s*it. When I saw they’re making an anime on a manga that only just started publishing, I predicted a car crash… Will never understand why, in a times where there’s no new shounen without a daemon dwarf, sticky romance or a reverse harem, they had to not make a filler arc and let the mangaka develop the story… They ruined Ao no Exorcist like they did to Soul Eater and Kuroshitsuji. I was so positive in the beginning! To both this anime and No. 6… in the end, they both failed me… although, this one is the worse. Is No. 6 manga any good? Some fat geezer with a thing for stupid twins? No way. I have to agree. It is shounen, but this is too much even for this genre.